Saturday afternoon in rainy London. We opened the door to be met instantly by a waitress asking if we were dining. If we had said no, we wouldn't have been allowed to sit at one of the tables that all had reserved signs - although they were just being kept for food eating punters coming in off the street. This meant that I couldn't see what beers were on and knowing it was a Youngs house, I asked for a special. It was that bad, I had to take it back to the bar, when I found out they dont do Youngs Special - just the standard. It was swapped without fuss for a Naked Lady (who could resist?) which was in much better condition. Food was OK. Service was good, seeing as how run ragged she was. Wouldn't necessarily come again. This pub is certainly pricey - £7.60 for a pint of Sambrooks Junction and a small bottle of orange & mango juice. There were 6 real ales on offer and my pint of Junction was on the drinkable side of mediocre; it was a bit sour. The acoustics aren't great and it's difficult to hold a conversation. The bar staff were better than average for the area. 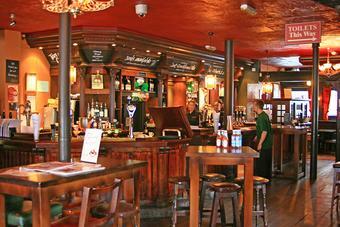 This pub is aimed at the tourist trade with an emphasis on food. It's no better or worse than other pubs in the immediate area, and the beer's slightly better than the Shades next door. 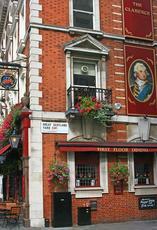 If you want real ale, try the Harp on Chandos Street 3 minutes walk away. I can only second Suedehead's comment, though can't recall the music. This pub was a big disappointment. Looks good inside and out but the ale was bland,the atmosphere was non-existent and the thing I dislike most in pubs,reserved tables. The menu looked ok. One last thing,the music was bloody awful. Popped in yesterday for a couple of pints of Sharp's Doombar and Coasters- typical soul-less London affair with the astronomical prices to match its location on the principal government avenue of the world's most important country. Anyway, menu was brief and usual british claptrap like curry, and the sandwiches were cheese etc etc - you know the story- �6 for a sandwich!!!! outrageous even in this over-rated town. Inside is a refurbed 80s London Overspill type bar- absolutely uninspiring.